In the second act of An American in Paris, leading lady Lise Dassin remarks on her inability to dance with passion. The company of An American in Paris, filmed live on the West End and hitting cinemas this month, need not have similar worries. At the screening I attended on Thursday, the passionate energy of the ensemble easily seeped through the screen and into the audience’s hearts. In fact, I felt more of a connection to the company on screen than I did when I saw the Broadway production live in 2015. This is in part due to the film medium’s ability to isolate intimate moments with close-ups while still allowing the production numbers to pop. Close-ups were particularly helpful for the book scenes, as I felt that many were swallowed by the vast stage and large house of New York’s Palace Theatre. 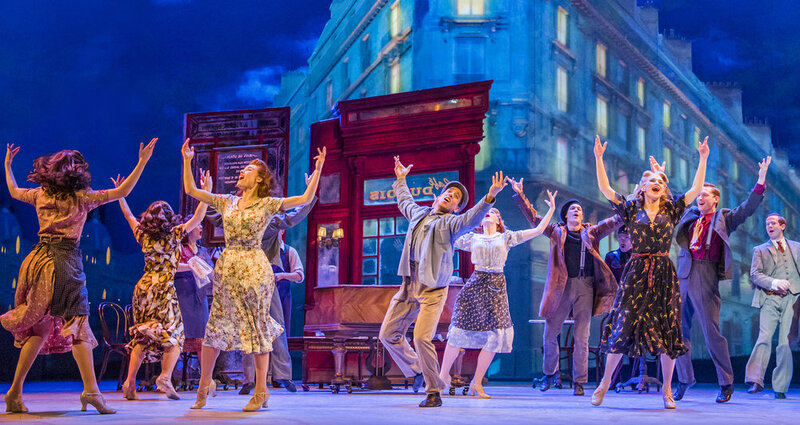 Throughout much of An American in Paris — particularly during transitional moments — the show’s 31-member ensemble becomes a physical manifestation of the energy of Paris. Their job is much more about creating a mood than populating the world with unique individuals. When not lifting the audience from one moment to the next, the ensemble has many opportunities to play ballet performers, wowing the audience with their dance technique and artistry. Because the camera is able to better focus scenes and the general use of the ensemble is so atmospheric, the few step-out moments that ensemblists have are all the more exciting. In particular, I loved Julia Nagle’s grand turn as ballet mistress Olga, complete with all the mugging you could possibly want from a character ensemble track, and Julian Forsyth’s touching performance as Monsieur Baurel. However, my favorite ensemble feature lasted but a few seconds and was over within the first five minutes of the film. A beggar woman, played by Katie Deacon, falls at Lise’s feet and is given some bread. Katie communicated the story of her character’s (and much of Paris’) devastating experiences during wartime so clearly with her physical choices, beautifully establishing the world in which the show begins. I felt her pain, desperation, dreams and so much more in this small moment, made all the more powerful onscreen. An American in Paris will be screened in the United States and Canada on September 20 & 23. Information and tickets available at anamericaninpariscinema.com.